Vote For Your Favorite Eagle Brand Ice Cream Recipe! 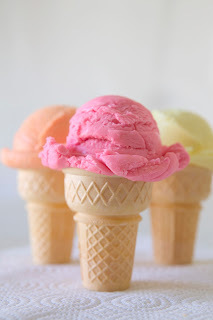 Anyway, it's time now to vote for our entries in the Eagle Brand Ice Cream Recipe Contest. Scroll to the bottom of this entry for the ballot and please be sure to vote by Tuesday, August 31st, 11:59 PM EST. Thanks to everyone for their fabulous entries! Once things calm down a bit here, I hope to try them out. Yes, Violet is going to be a huge ice cream fan just like her mom -- we need to get her started early, and these will probably do the trick! So July was a crazy busy month of daily posts and I have to admit I am psyched for the break but August, although we are slacking on posting, is an exciting one because our dear Bethany welcomed a little baby girl this past weekend. We are very excited for her new family and I am sure Bethany will have her eating ice cream in no time! So we do apologize for the delay in the Eagle Brand Ice Cream contest...baby B came a few days early before winners were determined but we are very excited to share the recipes and winners with you all so stay tuned! This could be yours!!!! So what's the catch...all you have to do is make some ice cream with Eagle Brand's Sweetened Condensed Milk and tell us all about it to be entered to win 1 of 2 Eagle Brand Prize Packs by August 11th. Go to Eagle Brand and look over the ice cream recipes to use as inspiration. Get inspired and make up (and test) your own recipe! 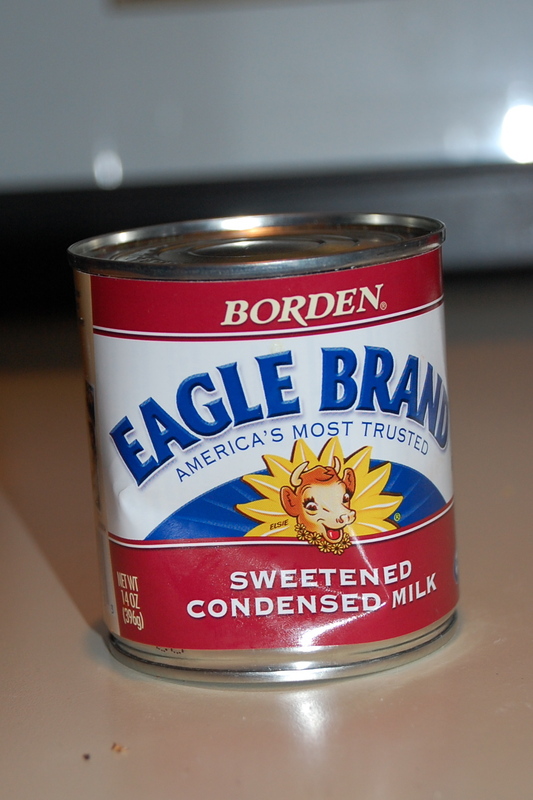 You can make straight up ice cream or an ice cream dessert, but it MUST use Eagle Brand Condensed Milk. It's preferred that you make this without an ice cream maker so we can appeal to the masses, but you can use your ice cream maker if you must (I did, Bethany didn't). Blog about your recipe and be sure to include a picture of the finished product! Send us the link to your recipe. If you don't have a blog, send us a write up and picture and we'll get your recipe up for our readers to see. We'll have a readers vote the following week and the top two winners will win the prize pack from Eagle. PLEASE NOTE: We can only ship prizes within the US due to high shipping costs and coupon restrictions! If you fill out the survey and DO win but do not live in the US, you can opt to have your prize mailed to someone in the states. Thank you and sorry for the inconvenience! It's simple. It's fun. And its a knock off from my awesome ice cream making co-blogger Bethany. So back in June Bethany had her amazing ice cream party and I dragged along my little girl who instantly wanted the "blue" ice cream which was Cotton Candy all the way. It was by far her favorite out of B's over 30 flavors so I figured this was a perfect excuse to try a go at it myself. I must say making ice cream without eggs is so much easier and Eagle Brand's recipes are short and sweet so making the ice cream was a breeze. I think the longest part was the churning. Basically I mixed all the ingredients and put it in my ice cream maker. But then it churned, and churned, and churned, and churned for what seemed like forever and it still never got to a true soft serve consistency so I gave up and put it in my fun new Zak insulated container to put in the freezer. I have to wait til tomorrow to find out how it came out but I of course had a spoonful before I put it in the freezer and it was quite sweet..I think Holly is going to love it! EB of Spice Dish sent this along. Love it! Thanks EB! I looooove ice cream sandwiches. 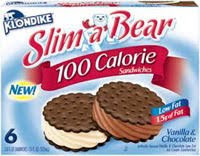 Actually I just brought home some Klondike 100 Calorie Ice Cream Sandwiches tonight. Okay so I am feeling guilty after a weekend of binging on vacation so I had to do the lo cal option but I must admit they are quite good. When I am craving chocolate but want ice cream too I think a sandwich is the perfect solution. I know everyone loves the Skinny Cow sandwiches but if I had to choose I'd go with Klondike's Slim-a-Bear sandwiches all the way. I think the ice cream is smoother and creamier but believe me I'd never turn down either. 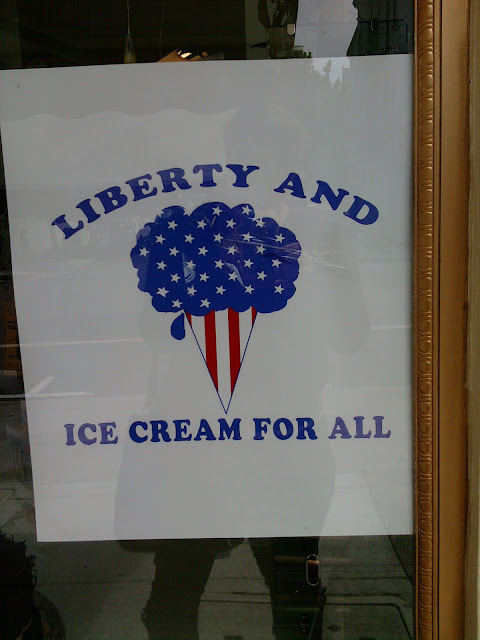 Regardless....its a good excuse today to grab a sandwich...an ice cream one that is.....and celebrate! Oh...and if you didn't see the fab article in last month's Woman's World...we at Scoopalicious scooped about ice cream sandwiches and a fun option we truly think is unique and yummmmmy!